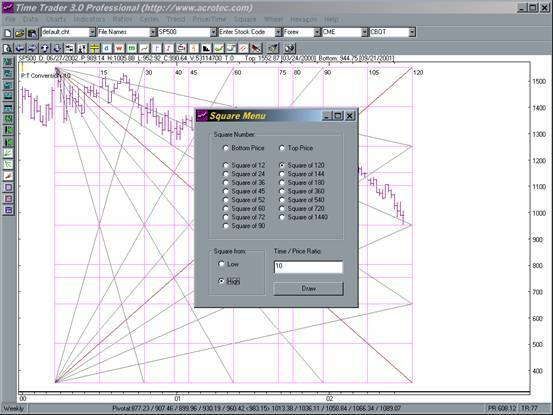 Time / Price Square is one of the mysterious techniques used by W. D. Gann. According to Gann, there is a mathematical relationship between time and price. Using the time to price conversion factor, the price can be converted into time cycle, which projects the market reversal date in the future. Where T is the time cycle projected from the market high, H is the price of the market high and CF is the conversion factor. If the chart is a weekly chart, the time cycle would be in the unit of week. Following the same line of thought, if the chart is a monthly chart, the time cycle would be in the unit of month. 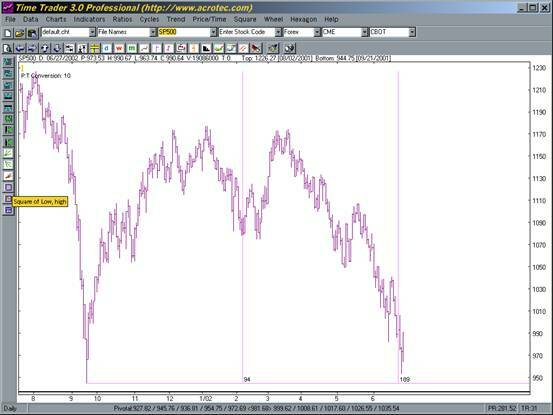 On the chart, pink time line would appear after clicking [High Price to Time]. The multiple time lines represent the multiples of the time cycle. Where T is the time cycle projected from the market low, L is the price of the market low and CF is the conversion factor. If the chart is a weekly chart, the time cycle would be in the unit of week. If the chart is a monthly chart, the time cycle would be in the unit of month. 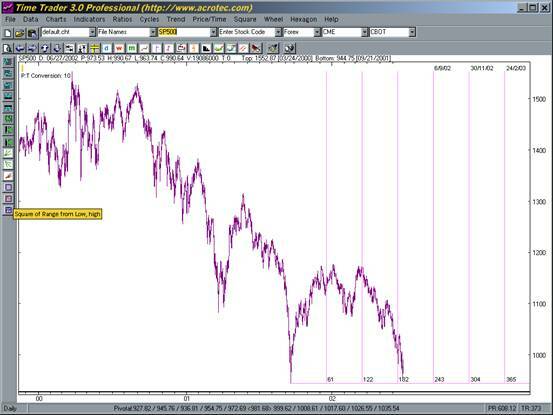 On the chart, pink time line would appear after clicking [Low Price to Time]. The time lines represent the multiples of the time cycle calculated. Where T is the time cycle projected from either market high or market low, which depends on user's selection of [From high] or [From Low]. PR is the high to low price range on the chart and CF is the conversion factor. 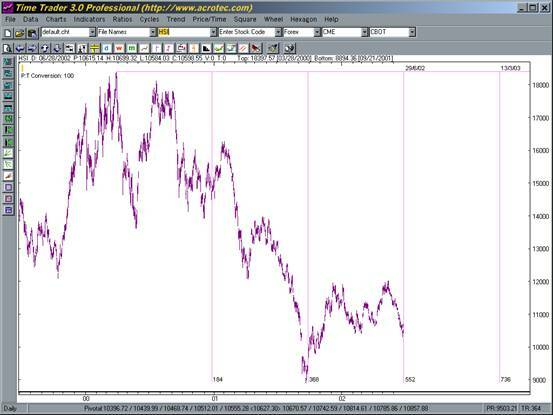 After selection, pink time line would appear on the chart. The time lines represent the multiples of the time cycle calculated. 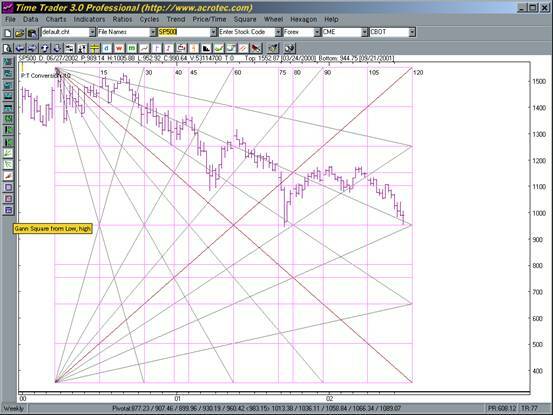 According to the theory of Gann, market reversals may happen near these time cycle lines. Each of the techniques has been discussed earlier in this manual. The low price on the chart would be multiplied from 1 to 8. That means the price levels of the multiples will be shown on the chart to show the support and resistance of the market. Low price would be multiplied by the Time / Price Conversion Factor in order to get the duration of the time cycle. The market reversal date may be projected by adding the time cycle to the date of the low price on the chart. The time lines appeared are the multiples of the time cycle. Upward Gann Angles are also drawn on the chart to show the squaring of price and time cycle when they are in parity at the 1 x 1 Gann line (Shown in red). Reversal forces may appear at the centre of the square, the top right-hand corner of the square and the conjunction of time and price lines. The high price on the chart would be divided by 3 and by 8. That means the price levels of the divisions will be shown on the chart to show the support and resistance of the market. High price would be multiplied by the Time / Price Conversion Factor in order to get the duration of the time cycle. The market reversal date may be projected by adding the time cycle to the date of the high price on the chart. The time lines appeared are the multiples of the time cycle. Downward Gann Angles are also drawn on the chart to show the squaring of price and time cycle when they are in parity at the 1 x 1 Gann line (Shown in red). Reversal forces may appear at the centre of the square as well as the conjunctions of price and time lines.